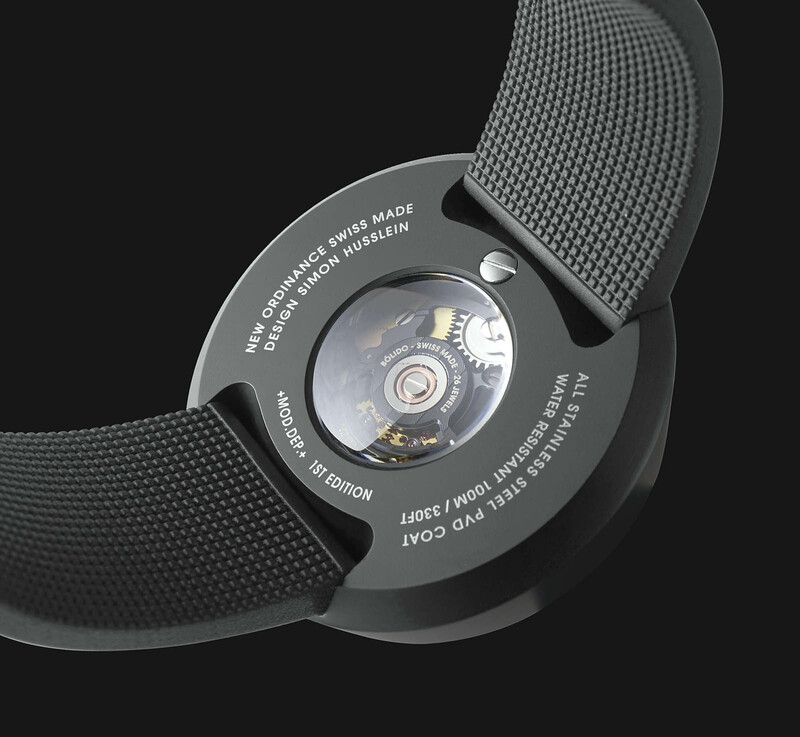 One of the most notable crowdfunded watch brands of 2017 was Bólido, a startup founded by two seasoned professionals tied together by Ventura, a watch brand now defunct but well regarded for its design – Pierre Nobs, the founder of Ventura, and industrial designer Simon Husslein, who now runs the late Hannes Wettstein’s design agency; Mr Wettstein was responsible for most of Ventura’s design sensibility. Unsurprisingly, Bólido takes a similar approach to aesthetics, with a minimalism reminiscent of Ventura but at a much more affordable price point. Launched on Kickstarter, the first Bólido models sold briskly and exceeded the fundraising target. And now the second generation, the Bólido Black Edition has achieved the same only halfway to the deadline. Like the original models, the case is minimalist in both style and fabrication, being monocoque and machined from a solid bar of steel by automatic lathing in a single operation. Despite the cost-effective production, case carries a strong and unique personality, particularly with the subtle slope of its topmost plane. The case is slightly thicker towards 12 o’clock, making room for the large crown and offering greater legibility by tilting the watch towards the wearer. And despite being a large 43mm in diameter, the case sits significantly smaller on the wrist as the band is fitted underneath the case. 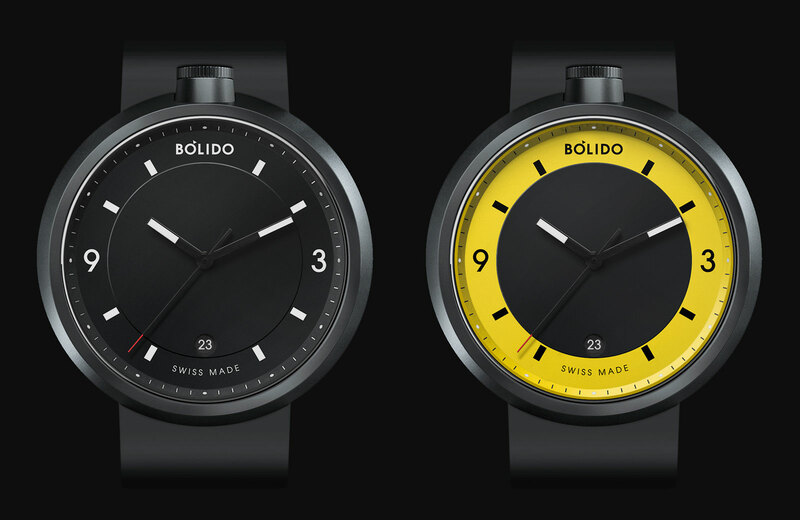 The Bólido Pure is all-black, with a black dial to match the black case, while the Bólido Halo features a contrasting yellow chapter ring. 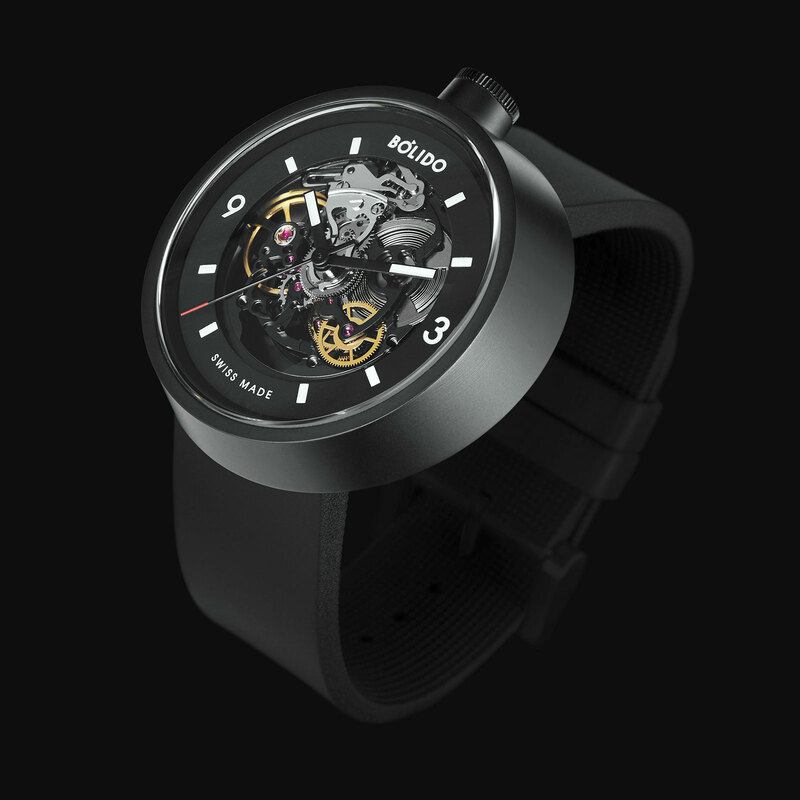 Both are powered by the STP 1-11, a clone of the ETA 2824 made by Swiss Technology Production, a subsidiary of American watch conglomerate Fossil. 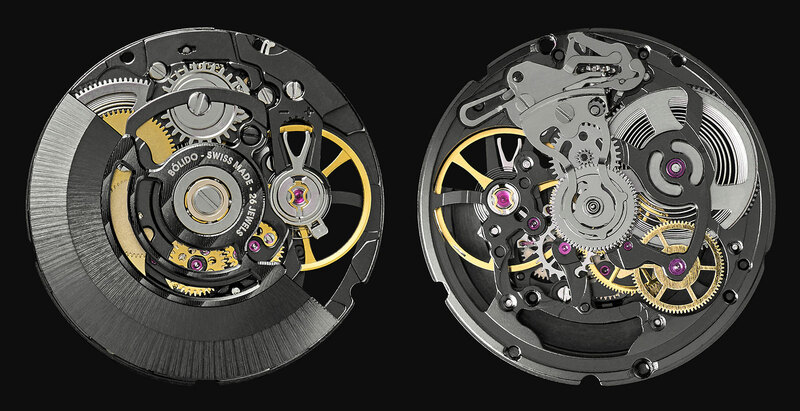 The movement has been regulated to five positions and offers a 44-hour power reserve. 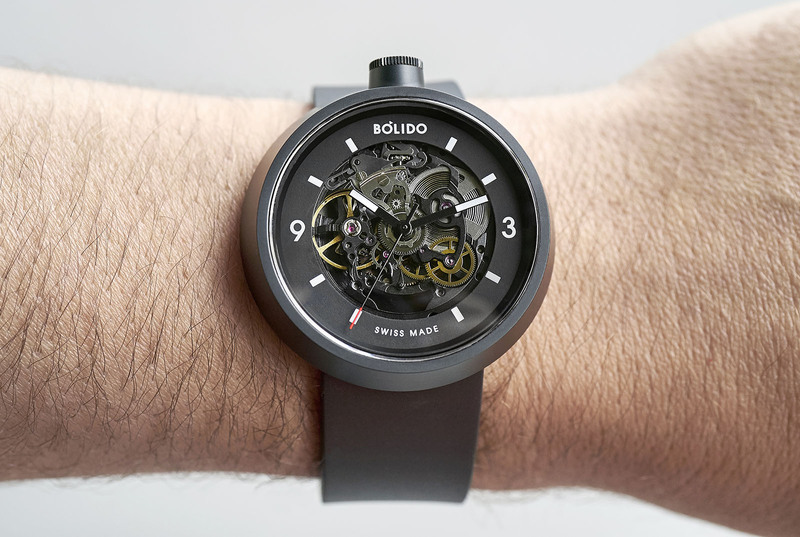 And the Bólido Core is the top of the line model, featuring an open-worked movement. The Core is equipped with the STP 6-16, a skeletonised version of the STP 1-11 that has its bridges and base plate plate coated, which contrasts well against its minimalist chapter ring. All three watches have luminous hour markers and hands. They are fitted with sapphire crystals on the front and back, and are water-resistant to 100m. 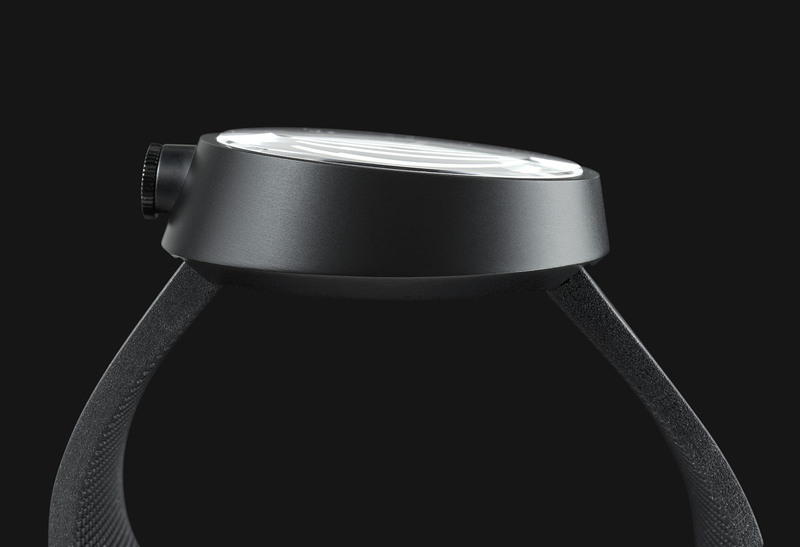 The Bólido Pure or Halo are priced at SFr460 for Kickstarter backers, with a future retail price of SFr690. And the Bólido Core is SFr595 now, compared with SFr990 at retail. They are available for pre-order on Kickstarter, with delivery in October 2018.